Like most awesome things, this one started as a discussion in a Las Vegas cocktail lounge. 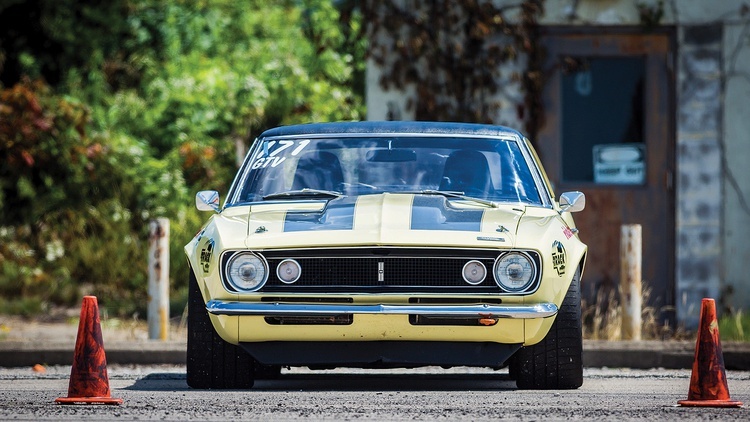 “After a long day at the SEMA Show a few years back, we were having a couple drinks and the discussion came up of just how good aftermarket parts for classic muscle cars are getting these days,” recalls Bret Voelkel. Certainly Bret should know, as he’s one of the guys making that statement a reality. As the owner principal of RideTech, Bret is in charge of a company that designs, develops and produces many of the parts that bring modern handling manners and capabilities to older cars. As the RideTech crew approached the project, they realized that while they probably hadn’t bitten off more than they could chew, “doing it” versus “doing it right” would be an important distinction. Bret and the gang knew they were representing a major aftermarket player, so the scrutiny would be high. It wasn’t like they were amateurs doing this in a dirt-floored carport in the rain. “We’ve got some great partners that we wanted to bring into this project, and we didn’t want to let them down or make ourselves look dumb, so most of the work went into planning. And we did set a couple ground rules for ourselves,” he explains. 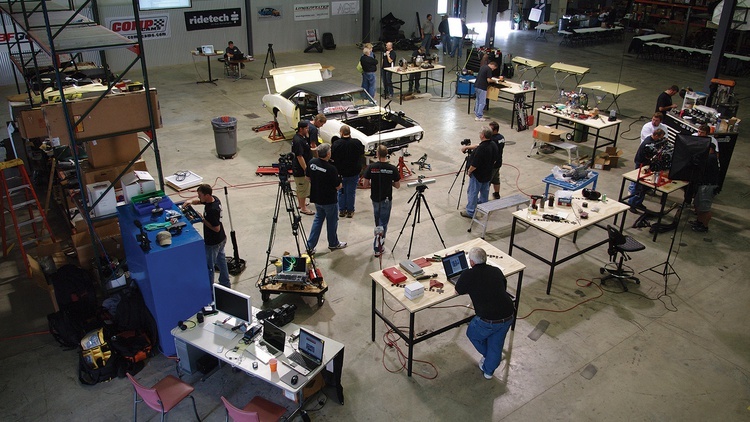 Even so, the RideTech crew spent nearly 10 months doing research, collecting and sorting parts, and planning the operation down to the nut and bolt. While the original idea called for teams of workers to go around the clock for two days and complete the build in 48 hours straight, the final plan saw them dividing things up a bit more to allow for contingencies. After completing the planning, the crew was ready to turn wrenches in May 2011. And once the crew got working, very little slowed them down. Not content with simply bolting on a few parts and calling it a success, RideTech gave the ’67 Camaro a fairly major reworking. A fuel-injected LS3 from Lingenfelter was installed, plumbed and wired. A T56 six-speed transmission replaced the original four-speed. Then there was the suspension: The original leaf-spring rear was tossed in favor of a coil spring setup. In the front, they bolted on RideTech’s Tru Turn suspension kit. It features revised spindles plus stronger control arms and bearings. The result: lower ride height, more wheel clearance and bumpsteer correction. Inside, the car got seating, safety and dash upgrades, along with an a/c system. The most dramatic thing about the build? How little drama took place. At the end of the final build session–after just 47 hours and 27 minutes of construction–the car was aligned, driven on local roads for about 10 miles, and declared ready for primetime. 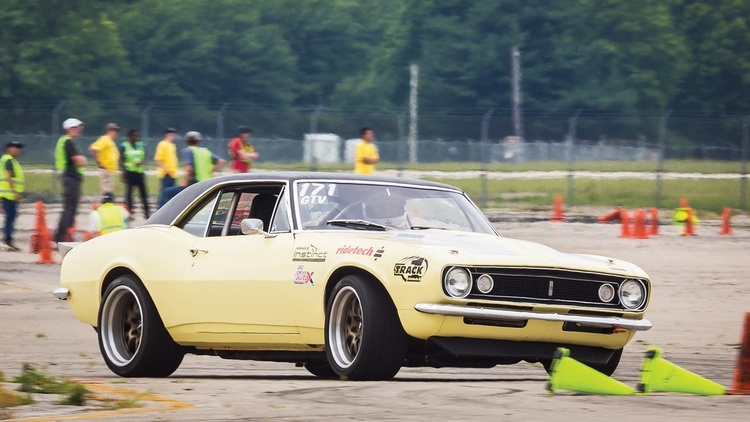 The Camaro then immediately embarked on a 200-mile trip from RideTech’s Indiana base to Nashville, where it promptly finished fourth in a Goodguys autocross. Then it drove back home. Most of that post-build wrenching has gone into the front suspension, which received an upgrade to RideTech’s Track 1 specs. Special RideTech brackets have raised the front shock mounts, while the steering linkage has been updated. The car’s footprint has expanded, too. The front fenders were flared to accommodate 315mm-wide BFGoodrich Rival S tires. The rear mini-tubs allow 335mm Rivals. Still, though, the Camaro uses the original factory subframe with no additional reinforcement or welding. That subframe attaches to the car with some half-height solid bushings that lower the center of gravity, but the attachment points all remain stock. The big update, though, has been adapting one of RideTech’s newest developments: their Instinct electronic shocks. 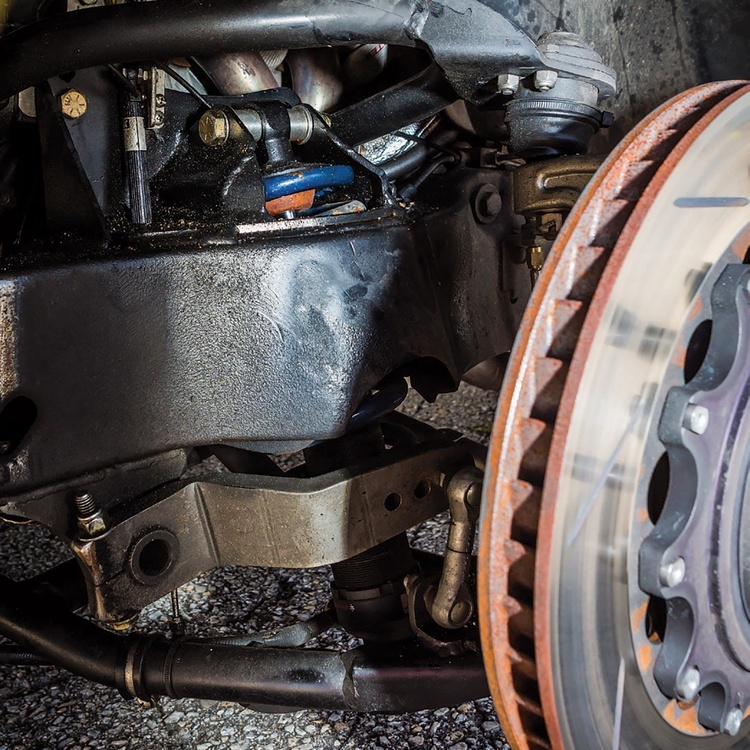 As the OEMs have found, controlling dampers electronically is a great way to provide a comfortable ride with the ability to tune for more extreme handling. 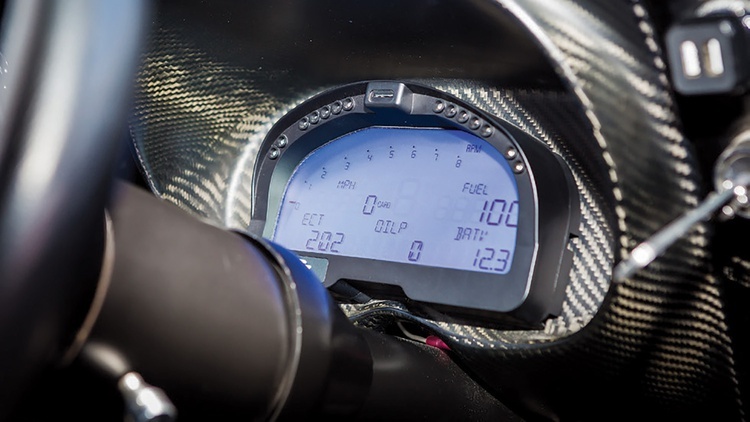 The Instinct system brings that technology to the aftermarket by using a dedicated control module that constantly monitors vehicle speed, throttle position, brake pressure and a three-axis accelerometer. The system can then adjust the shock absorber force curves on the fly. Unlike the OEM factory setups, though, the Instinct system is completely tunable through its control software. Adding desired rebound or compression at specific frequencies is a matter of adjusting a few numbers in the shock’s force tables inside the control program. While the Camaro is now on its second generation of suspension setup, the driver has received a system update as well. After running this Camaro for seven years on the pro-touring autocross and track circuit, Bret is moving on to compete in one of RideTech’s other project cars. His son Andy is taking over the primary driving duties in the vinyl-topped missile. We co-drove RideTech’s 1967 Camaro at Optima’s DriveAutoX event on the grippy concrete at Grissom Air Force Base in Peru, Indiana. The experience left us shaking our heads at how well a half-century-old car could behave. Then we started checking the classified ads to see if we had been priced out of the market for first-wave American pony cars. 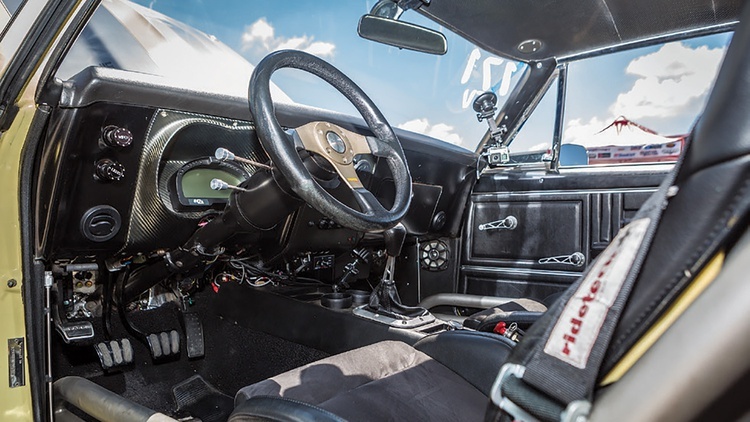 When facing the opportunity to drive an older car in a track or autocross situation, it’s easy to be predisposed to cut it a little slack. After all, these cars don’t feature modern unibodies. Bodies on frame were the norm back then–or, in the case of the original Camaro and Firebird, what can be called early unibodies paired with subframes. Decades of materials technology advancements and computer-aided unibody design have combined to make these floppy relics obsolete and dated, right? Uh, not so much. Those decades of advancement have also made it possible to retrofit older cars with hardware that provides a very modern feel. That’s the case with the RideTech 48-hour Camaro. Even the driving position feels modern thanks to the Recaro seats. The clutch pedal may be a little far away for someone with short legs, but it would be an easy job to completely personalize the already shockingly ergonomic interior to a specific driver’s wishes. The engine is a gem. 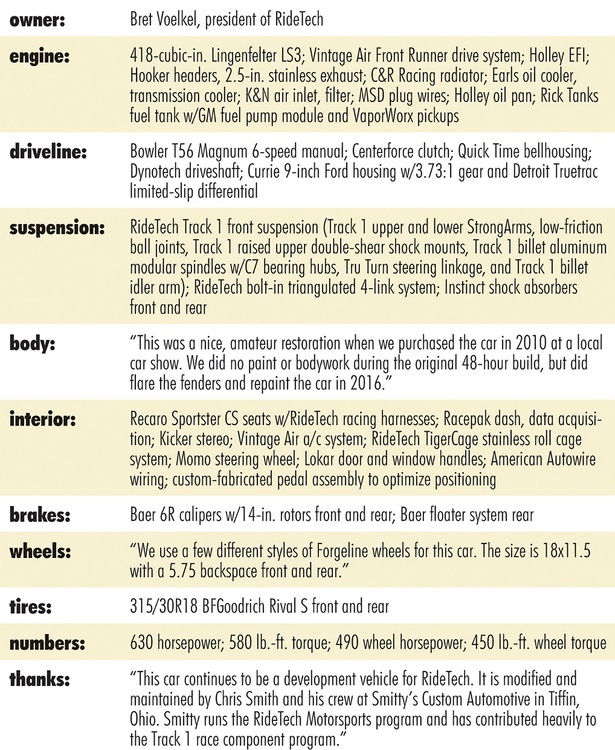 While Bret Voelkel claims that 30,000-plus street miles and countless full-send autocross runs and track laps have robbed a few of its claimed 630 horsepower, we wonder if he’s just gotten used to it after all this time. A modern Holley EFI system feeds the engine and controls the explosions, so it’s as tractable as any modern powerplant. Only the light, sticky Centerforce clutch and flywheel give away the fact that this car’s primary purpose is fast lap times. The light rotating assembly demands a delicate foot when balancing the chassis through the corners, especially when combined with the instant response of the injected engine. It also means that the car exhibits a lot more off-throttle engine braking, so gas and brake transitions have to be appropriately timed. But if we get our foot into it, the engine makes glorious noises. The four-link rear plants the tires so hard that the Camaro nearly lifts a front wheel while accelerating out of a corner–kinda like a Porsche 911. Power oversteer is available, obviously, but the chassis feels so neutral that there’s no real need to invoke it unless a driver error forces a more serious course correction. Steering is a little on the slow side–not surprising for an older car–but there’s an eye-opening amount of feel and feedback from those wide BFGs. It’s shockingly modern, actually. The non-power-assisted brakes don’t deliver quite as much feel, but despite the lack of vacuum assist, they’re well proportioned to the rest of the controls. Lockup is a risk thanks to the lack of ABS, but there’s still ample feedback for proper modulation. The electronically controlled shocks are a revelation. Their operation is completely transparent while driving. They simply feel like a great set of shocks that allow us to get away with stuff we normally couldn’t pull off. Their behavior at the rear is particularly impressive. We can feel the car moving and shifting over the concrete’s expansion joints and seams, but the chassis just keeps delivering power to the ground in a linear fashion. More than once we encounter an undulation in the pavement. Our natural instinct is to lift off the throttle, but the defect doesn’t upset the chassis. So on later runs, we attack those bumps with more throttle. The Camaro simply reacts and sticks. Shock absorbers are at their best when you don’t notice them–they just do their job and become one less thing to worry about. The RideTech Instincts seem to have that wired, literally and figuratively. They also helped us out of a bit of a jam when we broke a front anti-roll bar mounting tab. Hey, that subframe is 51 years old, so give it a break. We just popped open the laptop, hooked it to the car, and easily adjusted the front shock absorber settings to provide a little compensatory roll control. We were slightly faster the next day once we fixed the mount, but in the meantime this tweak heavily mitigated the performance loss caused by the broken tab. So, anyone have a first-gen Camaro for sale? We want our own modern performance car. See video of the RideTech 1967 Camaro on The Grassroots Motorsports YouTube Channel. Join Free Join our community to easily find more Acura and Chevrolet articles. So, not in a weekend, and not even in 48 hours. Just 48 hours of assembly time, with a large professional crew over multiple work days, as part of year-long project taking hundreds of hours of effort, to update a car that had already been restored. What is supposed to be notable about this? Do you mean beside everything you already mentioned? How did you flare the front fenders? What is MSRP of this project. Don't include labor, just the parts to duplicate. An LS3 from Lingenfelter is $11,000.00 to $22,000.00 depending what version you get, then everything else! I watched a lot of the build when they live streamed it. I've got my 67 RS SS convertible in the garage now putting in new trunk floor, trunk drop offs, torque boxes, etc.